Download ppt "Eric F. Vermote 1,2, Svetlana Y. Kotchenova 1, & Jose G. Roa 1 1 Department of Geography, University of Maryland, USA; 2 NASA/GSFC Code 614.5"
OC & BC 0.5° (ton) Eric F. Vermote 1,2, Evan A. Ellicott 1, Tatyana Laypyonok 3, Oleg Dubovik 4, & Mian Chin 2 1 Department of Geography, University of. LANDFLUX Assessment and Organization Workshop, June, 2007, Toulouse, France Atmospheric Correction in the Reflective Domain of MODIS and AVHRR Data Uncertainties. Vegetation Indices NDVI (Normalized Difference Vegetation Index) NDVI = [ρ NIR -ρ red ] / [ρ NIR +ρ red ], where ρ NIR/red is the measured reflectance. 29 th Review of Atmospheric Transmission Models Meeting Aspects of Polarized Radiative Transfer, June 14 A Vector Version of the 6S Radiative Transfer. Yoram J. Kaufman Symposium On Aerosols, Clouds and Climate, May 30, 31, and June 1, 2007, NASA GSFC Atmospheric correction for the monitoring of land surfaces. 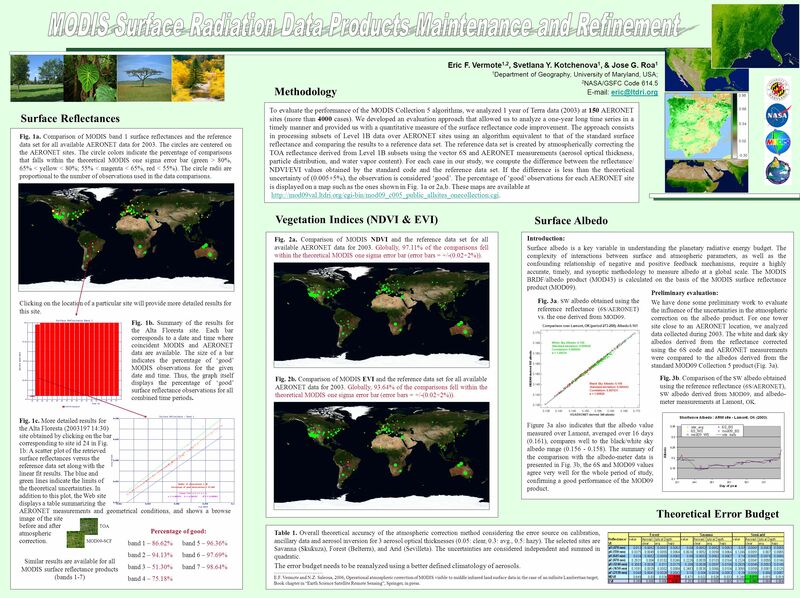 A Tutorial on MODIS and VIIRS Aerosol Products from Direct Broadcast Data on IDEA Hai Zhang 1, Shobha Kondragunta 2, Hongqing Liu 1 1.IMSG at NOAA 2.NOAA. The retrieval of snow properties from space: theory and applications A. A. Kokhanovsky 1, M. Tedesco 2,3, G. Heygster 1, M. Schreier 1, E. P. Zege 4 1)University. A33C-0161 On the New Satellite Aerosol Measurements for Atmospheric Applications: VIIRS Aerosol Products Summary Different match-up criteria also were. Deep Blue Algorithm: Retrieval of Aerosol Optical Depth using MODIS data obtained over bright surfaces 1.Example from the Saharan Desert. 2.Deep Blue Algorithm. A framework for selecting and blending retrievals from bio-optical algorithms in lakes and coastal waters based on remote sensing reflectance for water. Characterization of radiance uncertainties for SeaWiFS and Modis-Aqua Introduction The spectral remote sensing reflectance is arguably the most important. AIRS Land Surface Temperature and Emissivity Validation Bob Knuteson Hank Revercomb, Dave Tobin, Ken Vinson, Chia Lee University of Wisconsin-Madison Space.